Microalgae represent a considerable renewable biomass source for the manufacturing of existing high value bio-based products and the development of new, lower value products. Though, microalgae exploitation is restricted by high energy use and investment costs. Therefore, we conceive our section as a focal point to develop microalgae production and downstream processing technologies, microalgae-based products, and to inform about the latest advances in the microalgae field. Microalgae, belonging to the third generation feedstocks for biofuel production, have been of major interest in the last decade. They use solely sunlight as energy source and can be cultivated on non-arable land and by using sea-water thus saving fresh water resources. For the time being microalgae are basically cultivated for high value products in pharma, cosmetics or food and feed additives. Typical products are pigments and poly-unsaturated fatty acids. Ongoing research goes into the direction of opening larger markets to lower costs. These include fish feed, bulk chemicals, proteins and oils for human nutrition in large amounts and finally biofuels to substitute fossil resources. 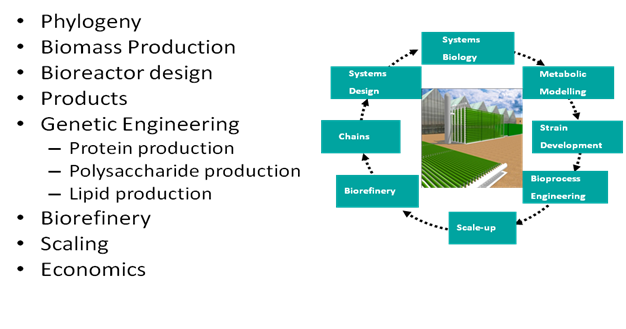 Large scale production will contribute fundamentally to supply mankind with enough bio-based products under the framework of the bio-economy. The specific biological and technical opportunities and constraints to develop microalgae production technology requires a concerted action of scientist and engineers. The section on Microalgae Engineering will be a focal point of these activities and a home for the people involved. A diverse range of activities are being explored in the field of microalgae as presented below. For biofuels alone microalgae production appears to be too costly, one of the main bottlenecks in algae production is the amount of energy used in the whole process and the investment costs. Microalgae are grown in large water volumes requiring mixing and for harvesting concentrating is needed, these are very energy-intensive processes. Moreover downstream processing is one of the most influential parameters for production costs. Most microalgae species have a tough cell wall, which needs to be cracked before being able to extract the product of interest, again an energy-intensive process. When exploiting the whole potential of microalgae ingredients many different products can be obtained simultaneously and the market value will be higher than the production costs. Therefore focus should be put on maximal exploitation of the microalgal biomass while minimizing energy use. Microalgae contain high amounts of lipids, pigments, proteins and carbohydrates, which all can be used for different markets. Moreover, integration into research and society will be looked at as well.